Iron Buzz Tattoos in Bandra West, Mumbai is voted as one of the best tattoo studios in India. 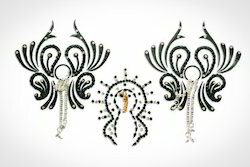 A perfect blend of traditional and modern body art, our range of designer body tattoo is widely in demand for eye catching designs that adds an exotic persona and glamorous look of the bearer. Affordable, clinically tested and temporary, these are created to express the eternal desire and bring beauty into every day life.